Two years ago I wrote about the Numi Flowering Teas (tea leaves that bloom into flowers when dropped into hot water). Tina got me a sample but I still haven't used it. Because I - don't - have - the - special - glass - pot. I have been drooling over the TeaPosy products at Wegmans for months now. TeaPosy has the cutest clear glass teapots, bitty dainty tea cups and their own line of flowering tea. And they are from Rochester! I do enjoy supporting my local businesses. You can just steep the tea in a bowl so you can watch the flower bloom. I didn't know they were local! Consumerism rules! I love buying stuff for no practical reason too! lucky olive - absolutely! We never gave up on you... we kept our eye out every week! That reminded me of the scene in Marie Antoinette. wow, i'm gonna have to keep a lookout for those. wow- I never heard of these. I just seriously fantasized about tea parties off in the distance for like 5 minutes. It looks so cool.. I have to have it now. 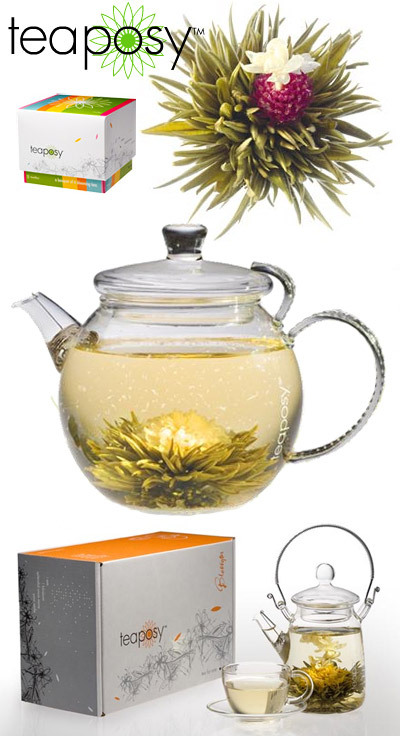 Have you seen Primula Flowering Tea Pot in Macy's??? The Primula Tea Pot is almost 3 times the size so I can use it as a center piece. It also came with 12 Primula Tea Flowers. Teaposy is toooo expensive compared to Primula.